As we all know, the latest iPhone 5 is thinner, lighter and faster than its previous generation and has a bigger (longer) screen. This bigger screen obviously enhances the overall visuals of any app. Not all apps have been updated to adapt to this new taller screen, but thanks to some efficient developers we have a number of apps which have already been up updated to fit the screen perfectly and ameliorate a user’s experience. So today we have a list of 43 iPhone Apps that Work Perfectly With iPhone 5’s Bigger Screens. All these apps are quite amazing, and a great way to enjoy and get the best out of your latest iPhone. Check them out and pick the ones you like the best! This one is a great app that allows markdown smart editing on your iPhone and getting your documents easily synced between all your iDevices and Mac via iCloud or Dropbox. It allows list continuations, quick conversion between bullet and numbered lists, choosing auto-wrapping for parenthesis, brackets, quotes and asterisks etc. This app will help you stay organized. It is a quick, handy and clever app that allows list-keeping. Make personal to-do list, shopping lists, list of important things/people, or lists of important phone numbers or addresses. Thanks to this app, you will now never forget anything. Corkulous Pro is an idea board which allows collecting, organizing, remembering and sharing ideas. It makes mind-mapping, taking notes, labeling, saving contacts and tasks possible. It boasts inbuilt iCloud support, making synching with other devices quite easy. You can also share your ideas etc with other by storing your boards in Dropbox. A free version with limited features is also available. As the name suggests, this app lets you sign documents and get signatures from others on your iPhone. Now you won’t have to get the document printed, faxed etc, simply get the signature on through an iDevice and Voila! This app allows signing PDFs, Microsoft Office documents, image files and faxes etc. It even sends you notifications when documents are signed. Using this app, importing cloud documents from Box, Dropbox, and Google Drive is also possible, which makes you task even easier. iTranslate Voice translates what you speak in another language of your choice, out of 36 supported languages. Using this app you can also look up definitions and meanings for common words and phrases simply by speaking them. You can also copy, mail, text or tweet it a translation. Temple Run needs no introduction as it is one of the most popular and widely played running game on the App Store. Race down the ancient temple walls while collecting coins, power-ups and avoiding obstacles! It is a very addictive and exciting game. W.E.L.D.E.R. is one of the most popular and addictive puzzle games out there. Weld words in the word machine! This game will definitely help you learn new words and increase your vocabulary! Minecraft allows bringing your imagination to reality (at least virtually). Create whatever you want in this game using some really cool blocks. It is a really good time-passing game which will keep you busy when you are bored. You can even play with your friends via the multi-player mode. 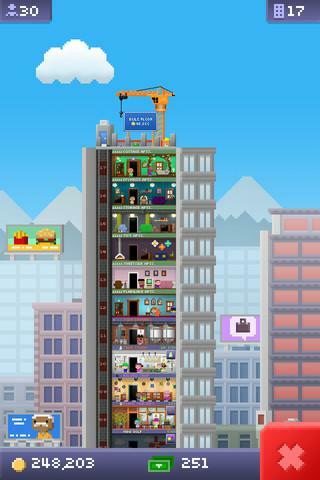 Build a tiny tower and handle all the business and financial affairs, and the bitizens that live there. Make the tower beautiful to attract the bitizens to come live and work there! Simple yet very addictive! Asphalt 7: Heat has been especially optimized for the 4-inch Retina display on iPhone 5 and boasts some really cool graphics. You can drive upto 60 most beautiful and fastest cars of the world and race in amazing tracks around the globe. Play in multi-player mode and beat the world! Touchgrind BMX is a really cool game that allows you to become a BMX pro and execute awesome tricks in some of the most beautiful locations around the globe. It has got beautiful 3D graphics, amazing sound and real physics. Share your best performances on YouTube and Facebook and impress your friends. Agent Dash has been optimized for iPhone 5’s amazing resolution thus offering stunning visuals. In this game your mission is to destroy as many villainous bases as you can! It boasts a plethora of really cool gadgets which help you finish your mission. It has Facebook Integration which lets you compete against friends. In this game you are the only surviving commando and were fighting against a ruthless dictator, but now you are stranded on the frontline. So use all your skills to survive! It has quality visuals, precise controls, advanced physics and some really cool weapons like artillery of assault rifles, sniper rifles, shotguns, rocket launchers, med kits, armor and more! This one is the ultimate strategy game on iOS. Internet connection is required to play this game. It is a story-driven game with great animations and visuals, with lots of magical characters, and horrible villains. It is a great action game of more than 300 missions spanning 45 levels with an innovative gameplay and humorous narrative etc. Stay happy while playing this fun game. Customize your characters, create your village, trade with your friends, discover different places, play with mini games, fish, craft objects, collect resources and meet some really friendly characters. Spell Tower is a unique and advanced word game. It combines words with strategy. Select you words wisely and keep the tiles rising from the bottom of the screen down. It is a very challenging game which is present in five modes with different gameplay and different levels of difficulty. This one is a unique family-friendly grocery bagging puzzle game. It has 60+ interesting levels and 3 endless modes – Ultimate Bagger, Endless Rampage, and Power Surge. This game might not sound very exciting, but in reality it is really fun. Wild Blood has especially been optimized for the 4-inch Retina display of iPhone 5, thus it boasts some really cool and rich graphics. If you are a fan of fantasy games, then you would sure love this story-driven, fun and action-packed game which has all one can wish for –magic, battle, mystical / mythical characters. Fight and defeat your enemies and explore beautiful hidden locations. You can also play in multi-player mode with your friends to increase the fun. Touch Hockey 2 offers some really cool features like competing for the highest score on each table, earning coins to buy all the fantastic content and more than 20 fantastic paddles to choose from etc. It is really fun and interesting. Pocket app was formerly known as Read It Later. This app lets you save the interesting content which you find online, which you don’t have time to view/read at that moment. Simply put it in the pocket and view it later. It automatically syncs to your phone, tablet, or computer so you can view it any time, even without an internet connection. If you are a news junkie, then you should definitely get this CNN app and stay informed and up to date with the latest headlines and original stories, no matter where you are. This app offers breaking news alerts and stories as they develop. View news/video clips in any of the categories: international, politics, opinion, tech and entertainment stories and more. Evernote needs no introduction as it is one of the most popular and widely used apps which keeps you organized and helps you remember all that you need to and save your ideas, thus ameliorating productivity. It allows making to-do lists, taking notes, capturing photos, creating to-do lists, recording voice reminders etc. All these notes and searchable and can be synced across all your devices.You can also share notes with friends and colleagues through Facebook and Twitter. NYTimes app is free to download, and everyone can access the Top News section, but only subscribers get full access to it. It has got two subscription options, one for $14.99 per month and the other for $34.99 per month, so you can get whichever suits you the best and going through the details of what each offers thoroughly. This app boasts the largest comic library and store of more than 20,000 comics with Guided View™ Technology. It has 500+ free comics while others can be bought. It has lots of popular publishers including Marvel Comics, DC Comics, Image Comics, BOOM Studios, Dynamite Entertainment, Red 5, TOKYOPOP, Zenescope and many more. Instapaper allows saving web pages for viewing later which lets you read content when offline later. It boasts optimization for readability on your iPhone’s screen, as it saved web pages as texts only. It has a user-friendly interface and is extremely customizable with adjustable fonts, text sizes, line spacing, margins, dark/ brightness reading mode and much more. Its feature also include Dictionary and Wikipedia lookups and the ability to share via email, Tumblr, Twitter, Facebook, Pinboard, Evernote, or other supported apps. Reeder is an awesome client for Fever, Readability and Google Reader. Fever syncing is optional and requires paid web app. Readability syncing is also optional and required free account required. Google Reader syncing is also optional and also requires free account. Its sharing services include: QUOTE.fm, Buffer, Readability, Instapaper, Pocket, Evernote, Pinboard, Zootool, Delicious, Twitter, Facebook (iOS 6 only), Messages and Mail. This app transforms any web page into a clean and single-column view for reading. It offers a great reading experience and lets you share what you are reading with your friends on Facebook, Twitter or by email. If you are a Twitter addict, then you can’t obviously live without it. You have to stay updated and tweet all day round. This app is perfect for all the Twitter lovers as if offers an organized stream of Tweets in your Timeline and handy tweeting features which let you tweet on the go, expressing yourself in Tweets and photos. Facebook helps you stay in touch with your friends and stay connected. Now you can use Facebook easily and quickly, thanks to this awesome app. It makes sharing updates, photos and videos and getting notifications of comments/likes possible. It also allows chatting or have group conversations, and playing games or use your favorite apps on the go. This awesome personal network allows connecting with family and close friends. It has a limit of maximum 150 connections, so only close people are added, which makes sharing even personal moments via updates, photos or videos safe and sweet. It lets you connect to the people that are the closest and matter the most. You can also share directly on Facebook, Twitter, Tumblr and Foursquare from Path. This app makes a personalized magazine out of things which are with you on various social networking websites Facebook, Google+, Twitter, Instagram and YouTube etc. Fill Flipboard with the things you like. It offers you a one-place solution to all your social networking needs. In addition to Twitter, Facebook and Google+, you can flip through your newsfeeds and timelines from YouTube, Instagram, Google Reader, LinkedIn, SoundCloud, Tumblr, Flickr, 500px, Sina Weibo and Renren on Flipboard. Pinterest is the place to ‘pin’ all your ‘interests!’ Pin all the things you love, or hate or plan to do etc. So this app lets you pin your inspirations to online pinboards so you can find them later. You can also follow boards that interest you to discover even more and interact with people having similar interests and likes/dislikes. This app boasts hi-resolution graphics which bring the best out of retina display. It offers two subscription plans: monthly for $2.99 or annually for $9.99. Then you can get all the information you want about MLB on this app. It offers news, home and away radio broadcasts, in-progress video highlights, schedules, rosters, stats and much more. Skitch helps yu express more with fewer words, using the awesome shapes, arrows, sketches and text annotation it offers. It allows marking up photos, screenshots, maps, and webpages then sharing them with your friends over Twitter and email. You can also save your creations with Evernote for using later. This one is a fabulous photo editing app which lets you add spice and style to any photo easily and quickly. It lets you give your photos a dramatic look by converting them to black and white, while you can keep the colors on the details you choose. In simple words, make the whole image black and white, while keeping one or more element colorful. You can import images from Facebook, Instagram or Flickr. Sharing them on Facebook, Flickr or Twitter is also possible. Brushes is a really cool painting app in which you can paint using your fingertips. It lets you create big size painting of dimensions up to 2048×2048. Make a mistake? Well, worry not as it offers unlimited undo and redo. It has a user-friendly interface with lots of features like different brush sizes, adjusting color opacity, zooming in and out, and importing/exporting your to Dropbox, Twitter or Facebook. This app has the ability of turning your photos into stylish comics. It has many awesome features like adding special effects, paper styles, captions, speech balloons, graphic stamps, and fonts (including inbuilt comic fonts), cropping/rotating the image and other such editing features. You can also open images directly from Facebook, Flickr, and Instagram. It allows sharing your creations via e-mail, Facebook, Twitter, and Flickr, Instagram, Dropbox, Camera+, Color Splash, or get it printed, and even sent as a real postcard via mail! Video Star is a great app that lets you and your friends make music videos! It offers a plethora of fun real-time effects which can be added to the video. All you have to do is to pick a song from your music library and start shooting the video. You can pause whenever you want to set up a new scene. The music stays perfectly synced. YouTube upload and sharing is inbuilt. View weather conditions and details with style using this app. It has beautiful weather visuals with subtle animations. It lets you keep tabs on the current weather conditions in your locality. It also offers 5 day weather forecast, Hourly weather forecast breakdown and detailed weather information such as Precipitation, Visibility, Humidity, and Pressure level details, wind speed and direction details etc.You can also hare weather conditions with your friends via Twitter or Email. This app allows spotting good food to eat, thus the name food spotting. It is a really cool app for finding and rating dishes, not only restaurants. It is a great guide to find good food of your choice around you, no matter where you are. Bookmarking the dishes you want to try and hiding the ones you don’t is also possible. The name says it all. This app takes away all the hassle of searching flights and hotel and makes your life a lot easier. This app displays all the relevant flights on a timeline so you can choose the one that suits your needs the best. Hotel results are displayed on a map, so you can know the location. This app even helps you book flights and hotels in various ways easily and quickly. This one is an app of the bestselling cookbook named “How to Cook Everything®” by New York Times columnist Mark Bittman. This app boasts 2,000 recipes, 400 how-to illustrations, which are all searchable. The recipes guidelines in this app are quite easy to follow; and you can even convert temperatures and quantities to metric. It allows emailing up to 10 recipes/ month to yourself or to friends, and sharing what you are cooking on Facebook and Twitter. This app is a fabulous guide to find good restaurants to eat out. When you rate restaurants, this clever app understands your taste and displays personalized recommendations according. Now finding a good place to eat out nearby is no big deal, thanks to Ness! Word Lens helps you see the world translated into your own language, no matter where you are! When you face your camera to printed words it translates them easily and quickly without internet connection, and you can see the translation on the screen. Please note that language packs are required to be purchased separately from within the app. It has support for three languages Italian, French and Spanish which can be translated. You can also find translations by typing the words or phrases in. It can prove to be really helpful for travelers. Thank you for posting this great list, Amina. I just upgraded to an iPhone 5 after months of ribbing from my DISH coworkers because I still had a flip phone. So, I have this Smartphone; now I need some good apps for it. There are so many apps and games here that it will probably take a few hours for me to check them all out. I would like to suggest an app that I found last week. It’s called DISH Remote Access and I have been using it to stream live TV to my phone, and I can stream DVR recordings from my Hopper too. I have been using it to watch the Playoffs while at work because I don’t have a TV in my office, but now that I have this magic phone I don’t need one.